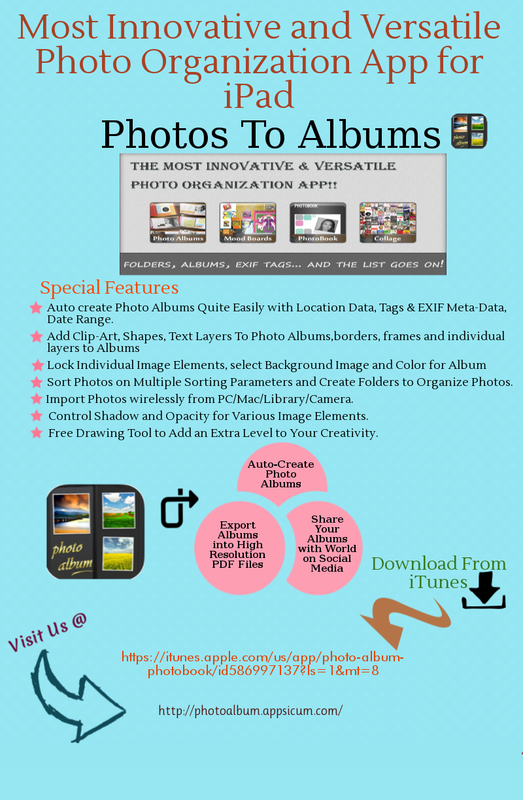 Photos to Albums is the most Innovative and versatile photo album app for organizing your photos on iPad. Now You can auto create albums based on location data, EXIF Meta-data, tags, date range etc and can manage your photos more effectively with this stunning photo album app for ipad. App is available for ipad and ipad mini while having some cool features like there are albums and folders in one app, There is a drawing tool which will bring your creativity to next level. You can add clip art, borders, shapes, frames to your photos and albums. You can export your photos as high resolution pdf files. Also, wireless transfer of photos have been enabled in the app. Visit http://photoalbum.appsicum.com/ to have a complete look up on this stunning app.